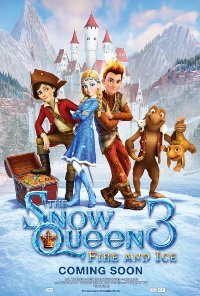 Episode 3 in this Russian animated series continues the story of Kai and Gerda, who have now grown up and entered a new stage of their lives. This time around, the habitual trouble-makers are going to cause a global disaster! This film is releasing in 2D and 3D. This is the 3D version. Violence Fairly frequent, low impact, fantastical, unrealistic animated violence.